Vintage From Paul is pleased to offer this sparkling, vintage crystal Petals Footed Torte Plate from Nachtmann. Petals has six deep bevel cut leaves on the underside, forming the petals of a rayed flower. 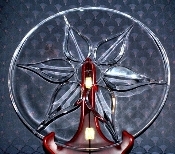 Three of the leaves have tips which are turned to form the three feet of this stunning piece of German crystal. The center of the flower/design is acid etched with the Nachtmann crown and "Nachtmann". The Nachtmann Crystal Vintage Petals Footed Torte Plate is massive in weight, itself weighing 5 pounds 8 ounces. The weight is due to the high percentage of lead,adding not only to the weight but the ability to achieve deep cuts and to the overall sparkle of the crystal. The Nachtmann Crystal Vintage Petals Footed Torte Plate in Mint condition with no chips, cracks, deep scratches, sickness to the glass You won't find a torte plate which has been as gently used and lovingly cared for...obvious from its current Mint rating! Nachtmann Crystal Vintage Petals Footed Torte Plate: 12-7/8 Inches in diameter. The crystal is 7/8 of an inch in thickness.